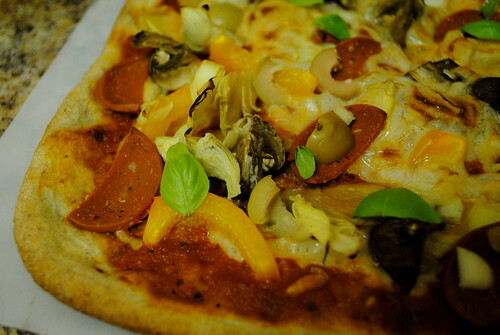 As I believe I have mentioned oh, about a hundred times on here, I love making pizza at home. 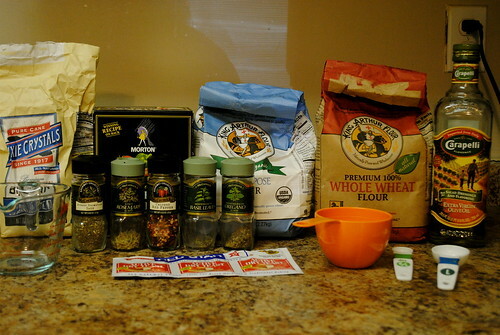 It all started when I found this great recipe for whole wheat crust here. I’ve been making it all the time, usually on the weekends after a long run when I want to eat a big dinner and relax at home. I made some again tonight (after my 7-mile run and day of grading papers) and I decided to photo-document it for you. You can use this post as a recipe — I have tweaked a couple of things from the original recipe just through practice, so mine differs just a bit from the source I linked. and mix them together. 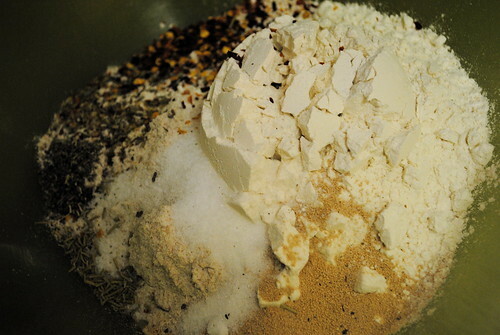 No food processor needed here; just use a dang whisk! Stir the olive oil into the hot water and pour this over the dry ingredients. Mix it up by hand. Look, you really don’t need a mixer or any type of equipment. Use the hands your momma gave you. The feel of the dough will guide you. It will be sticky at first, but when it is all smooth and elastic, you’ll know you have mixed it well. Depending on the humidity of your weather and the exactitude of your measurements, you may need to add a touch more flour or water. You be the judge. Isn’t this fun? Remember, smooth and elastic are your goals here. Cover the balls with a bit of plastic wrap. You can spray the plastic wrap with non-stick cooking spray to avoid any problems with stickage. Wait 20-40 minutes for the balls to rise. Heh. “For the balls to rise.” Balls. Then punch down the dough. 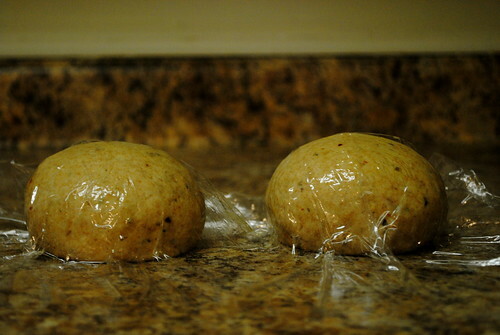 If you decided to use only half, wrap up the half you’re not using in the plastic wrap from before and refrigerate it. It can keep for maybe 3-5 days, but in my house it usually gets used in 1-2 days. I like pizza, I am saying. Take the half you are using tonight and flatten it out by hand. 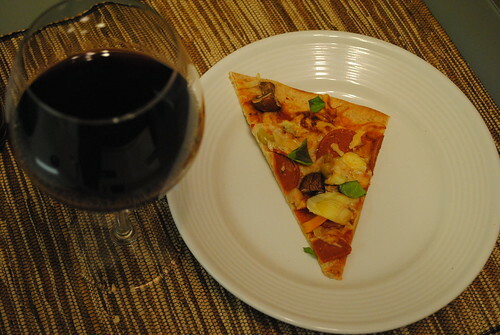 If you like really thin crusts, you can use a rolling pin or wine bottle to help you get it reeeeally good and flat. I don’t have a pizza stone, so I bake it on a regular old baking tray, covered in foil, and sprayed with just a teeny spray of non-stick stuff. Makes clean-up easy. What will you top your pizza with? Whatever you please, please. 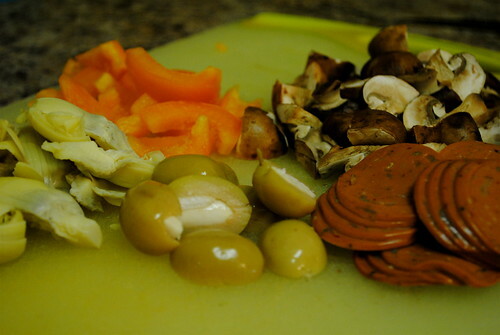 I’ve got orange bell peppers, fakeroni, olives, artichokes, and cremini mushrooms. Usually I also like some spinach leaves and/or broccoli florets for more green, but today I was just working with what I had available. Put it in a 500 degree oven for ten minutes. YES, 500 degrees. YES, ten minutes. Trust, people. During these ten minutes, you could be conscientious and clean up your kitchen a bit, but I recommend prioritizing your time. 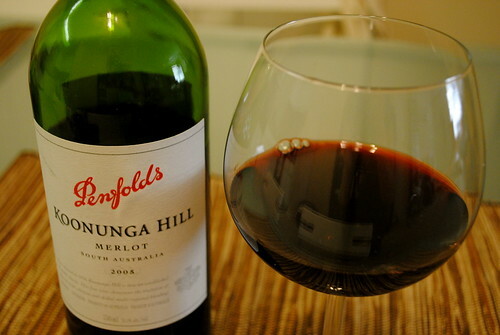 Pour yourself a glass of wine first. Oh, hey, look, the pizza is done. Top it with some fresh basil leaves from your favorite plant. yay! thanks for posting this. i have been craving all manner of “bad” food, and it’s easier to mitigate the badness when you make it at home. plus, that pizza y’all made at claire’s was soooo good, can’t wait to try this. No problemo! It’s such a regular thing in my kitchen life it probably was long overdue for a blog post. I personally love this pizza for the exact reason you stated. 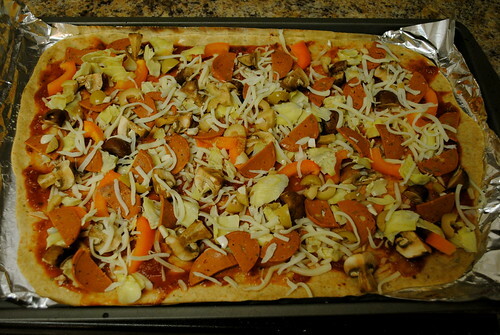 You start with a healthy crust and you can decide exactly what and how much goes on it. No one will be secretly slathering it with butter or olive oil as many restaurants do. (Unless you decide to do that, in which case it would not be a secret.) Limit the cheese and meat, do lots of veggies, and you’ll have a dinner basically beyond reproach, health-wise. So glad you shared — I’ve wondered about your recipe since you talk about it so much! 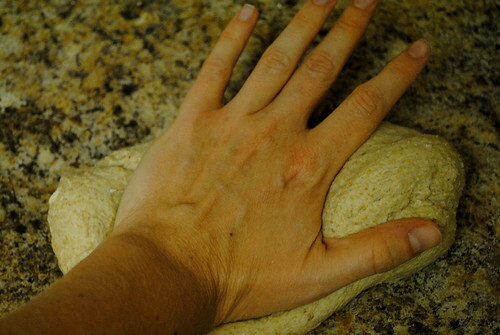 And I’ve never made my own pizza dough … I’m a bit nervous, but inspired now, too. Did you ever try the foccacia? Basically you mix the same recipe but you let it rise in a bowl with a damp cloth over it on a warm surface (I sit it on the oven while it’s preheating) & you don’t roll it out, just flatten it to about 1/2 thick on/in a pan. Brush the top with olive oil. It’s delish too with some balsamic vinegar. Anyhoo, we make this all the time too. I’ve even stopped using my mixer 🙂 It’s just too much trouble to haul it out of the pantry for something so easy to do. Yay, everybody is making pizza! Go forth and bake, my pizza loving people! K – It is actually pretty easy, and the more you do it the easier it gets! C – I still need to try that! Every time I think of it though I don’t have anything I want to eat with it. I think next time I make soup (which could be soon, with all the butternuts I got!) 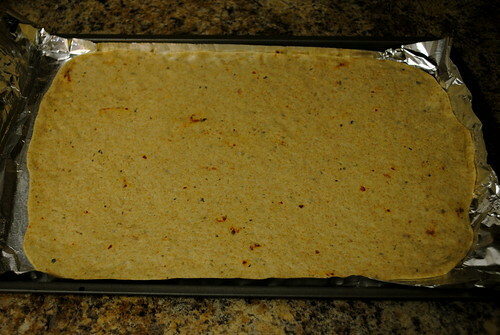 I will do some focaccia to have with it. SB – Yay, thanks for stopping by! I am off to check out your site, too! Triffic recipe, K. For those like me trying (unsuccessfully) to abstain from unnecessary plastic use, you can skip the plastic over the dough bit by just putting the dough in a bowl and covering the bowl with a damp tea-towel. 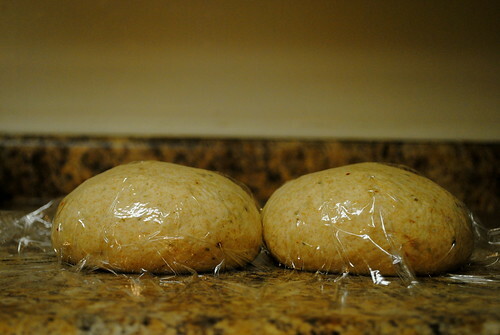 Same effect, i.e., the dough doesn’t dry out while it’s proofing. Ack! So, right after extolling the delights of plastic-free dough-rising, I noticed your very nice turquoise cardigan. Turquoise/teal/green fetishist that I am, I clicked through to your About page to see it in its cardigany splendour, and my eyes fell on unsolicited advice, hatred thereof. Sorreeeee. I exhale advice like normal people exhale carbon dioxide. Ha ha! Nothing to worry about. Your advice was actually very good and sensible and I AM actually trying to improve the eco-friendliness of my kitchen! That bit in the about page is more directed at, well, certain relatives of mine let’s just say. Oh. Relatives. They can be fun not to listen to. Also, I really love your life at the moment. It’s looking pretty darn happening. Thanks. Just trying to hang on tight! Um, how does a local snag an invite to pizza night??? I could bring wine and a doggie playmate . . . Oh, and I can chop stuff. I picked that skill up last week. Oooh yeah, we will definitely have to do this. I can share all my, um, brilliant kitchen knowledge! made the recipe tonight! did a margherita style with basil, shaved garlic, tomatoes & fresh mozz. came out pretty good, though my crust was not as beautiful & puffy as yours when it was done. i wonder if it’s because my white flour was kinda old. i spose it could also have something to do with being in the desert and the relative dryness here, maybe i need to compensate with more water. 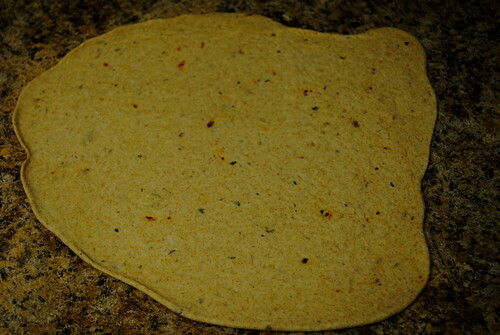 it was still good, just more like a flatbread. Mel, that sounds really delicious other than the crust texture issue. I have had that happen to mine before. 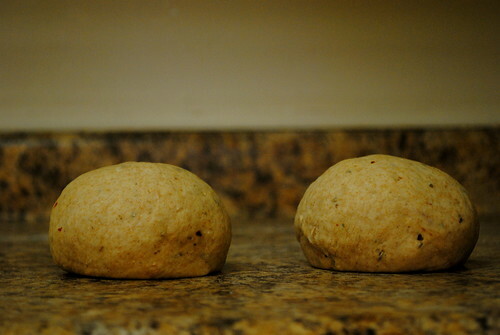 I usually can kind of tell, because the dough feels a little stiffer/tougher than usual. I think adding a bit more water at the start helps. 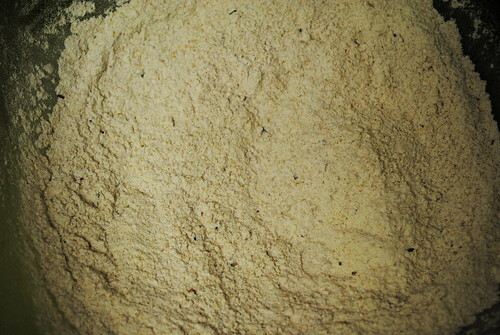 If you add too much, just balance with more flour.